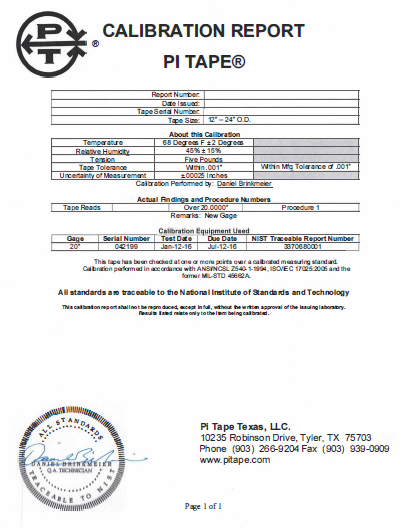 Tapes are constructed in the USA by Pi Tape Texas, LLC, easy reading of any outside, inside, inside O-Ring diameter or circumference measurement. Accuracy 0.03 mm up to 3600 mm. Metritools offers as well a large range of digital diameter tapes and linear digital tapes, as always top quality, calibration certificate is included for both ranges. Pi Tape products are well-known worldwide since 1944 and are used in several areas, such as aerospace, automotive fields, logging industries, construction, etc. 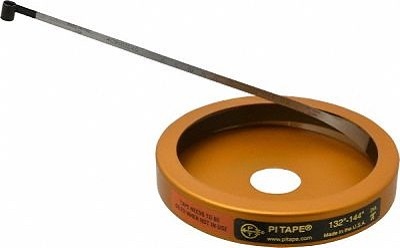 Pi Tape metric tapes have a diameter accuracy of ± 0,03 mm up to 3 600 millimeters. 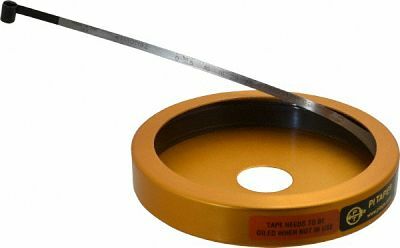 Pi Tape inch tapes have a diameter accuracy of ± 0,001" up to 144 inches. In addition, Pi Tape can construct measuring tapes with customized lengths and widths to meet your every need. Each Pi Tape measuring tape is delivered with a calibration report traceable to the National Institute of Standards and Technology &lpar;N.I.S.T.&rpar;. All calibrations are performed in accordance with ANSI&sol;NCSL Z540-1-1994, ISO&sol;IEC 17025, ISO 10012-1, MIL-STD 45662A, 10CFR21. Meets the most common industrial applications, except for corrosive environments. Particularly suggested for corrosive environments, efficient in a multitude of industrial applications. Specially designed for use in low light environments or highly reflective conditions, except for corrosive environments. Introduced in response to requests from the plastic pipe industry, it can also be used in low light applications, except for corrosive environments. Pi Tape digital diameter tape switches from metric to inch and from inch to metric by the push of a button. Accuracy starts from ± 0,06 mm, made of 716 stainless steel, delivered with a calibration certificate. Pi Tape linear digital tape switches from metric to inch and from inch to metric by the push of a button. Made of 716 stainless steel, accurately measurements of lengths in millimeters or inches. Accuracy starts from ± 0,13 mm up to 3000 mm length, delivered with a calibration certificate.